We celebrated Wolfgang’s 250th birthday – and our own recent 60th anniversary – by giving a memorable Mozart Concert at the RNCM in front of a packed and enthusiastic audience. The choir was supported by the Lancashire Chamber Orchestra (amateur but excellent), with organ continuo provided by Jeffrey Makinson, and four RNCM soloists – Laura Hudson (soprano), Diana Hatfield (contralto), Christopher Turner (tenor) and Philip Shakesby (baritone). Our Musical Director, Steven Roberts, conducted. The three-hour rehearsal started promptly at 2.30pm.When we rehearse on Monday nights, Lydia Bryan provides expert piano accompaniment, but the music sounds very different when we practise with the orchestra. On this occasion, many of us had had the luxury of attending the final orchestral rehearsal the previous weekend. Nevertheless, Steven had a demanding afternoon bringing the choir, soloists and orchestra together. Many of the choir stayed behind after our choral commitments had finished to listen to Lydia rehearse with the orchestra. This was an extra treat in what was already an exciting afternoon. Many of our audience come from the Altrincham area and they are offered a free return coach trip to the RNCM. This turned out to be so popular that we had to hire two coaches! 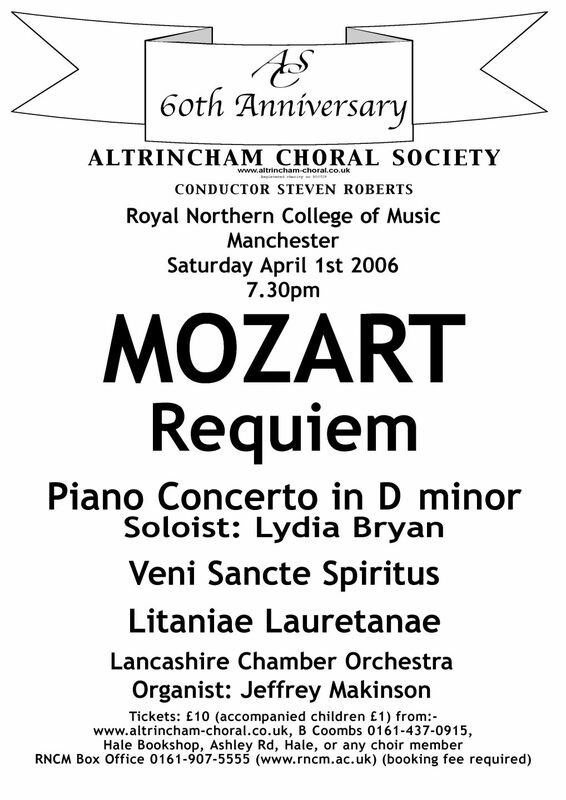 Our concert began with Veni Sancte Spiritus, a short, lively work written by Mozart when he was only 12. I found the joyful Alleluias section most attractive. It was followed by Litanae Laurentanae, which consists of five movements. The first movement is mainly choral and we found it quite challenging. The rest of the work was a showcase for our excellent soloists, together with short choral sections. This work is rarely performed, but I think we did it justice. The final work before the interval was the Piano Concerto in D Minor, in which Lydia Bryan gave an outstanding performance. After the interval the choir sang the well-known and much loved Requiem with a passion and conviction which clearly communicated itself to the audience. There are some really magical moments in this work, including the bass Requiem entry on the very first page, the Sanctus and the Hosanna, to mention but a few. The enthusiastic clapping (and whistling!) at the end of the evening suggested that the audience too had enjoyed the performance. It may be significant that no less than seven singers joined the choir after the concert. The very next Monday we started rehearsals for our Summer concert, ‘West End Nights’, in which we sing hits from Les Miserables, Miss Saigon, Sweet Charity, Oliver, Chess, Carousel and others. It just might be another wonderful evening! Conducting Mozart brings with it an excitement and privilege that at times is unparalleled by any other composer. It is of course no accident that this concert should be featured in the 250th anniversary year of his birth, but this music still sounds as fresh and challenging today and maybe even more so than it did at each of their first performances. The ever so familiar opening of the Requiem is capable of creating a sense of excitement and thrill amongst players and listeners alike. But, this concert is not just about the Requiem; it captures Mozart’s youth, exuberance and maturity in three further complementary works. This concert takes us on a journey through the different stages of compositional development of this remarkable prodigy. The Veni Sancte Spiritus which opens the concert was written when Mozart was aged only twelve, the Litaniae Lauretanae at the age of 18, the Piano Concerto at the age of 29 and the unfinished sketches for the Requiem in the year of his death aged 35. It is a particular delight to be featuring as soloist our accompanist Lydia Bryan, who captures a real exuberance in the outer movements of the Piano Concerto contrasting with exquisite beauty in the slow middle movement. But, the crowning glory has to be the Requiem, shrouded with mystery and the subject of many theories into its origins. Regardless of all this, it still sits at the top of every choral singers list of works to perform. It is challenging, exciting, moving and inspirational. What more can be said? Enjoy!